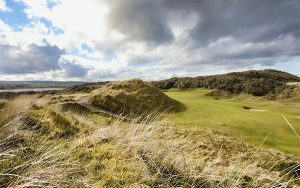 There’s no better challenge for a golfer than the incredible links courses of Northern Ireland combined with the brute force of the Atlantic Ocean or Irish Sea. If you’ve spent your days searching for quality links golf then look no further than Royal Portrush, Royal County Down, Portstewart, Castlerock and Kirkistown, to name just a few here on offer. When you step onto these tees you’ll be met with the fiercest of conditions that are matched only by the incredible natural beauty of the surrounding vistas and shorelines. This is what Northern Irish golf is all about so step forward and embrace some of the finest golfing tests the world has to offer. Northern Ireland is set to enter a golden age of golf as the land we call home prepares to welcome world greats over the next number of years. Why don’t you join the fun? 2017 marks the third occasion in the last five years in which the Dubai Duty Free Irish Open has returned to Northern Ireland. 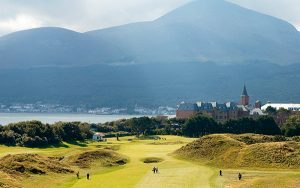 The long running European Tour event was hugely successful on both occasions when it was hosted by Royal Portrush in 2012, when advanced tickets sold out for the first time in tour history, and Royal County Down in 2015. 2017 marks the competition’s return to the north coast, July 6th-9th, when it will be staged at Portstewart Golf Club, one of the country’s finest links courses set in the midst of the incredible, natural Causeway Coastal Route. The event, hosted by the Rory Foundation, is set to be a fantastic one as the European Tour rolls into town and the continent’s top talent battle it out on the Des Giffin designed Strand Course. 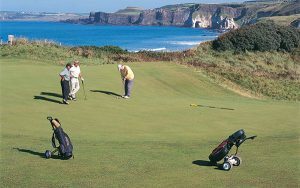 The Causeway Coast Amateur Golf Tournament is the largest amateur golf tournament in Europe which is held every summer on the stunning North Coast of Ireland. 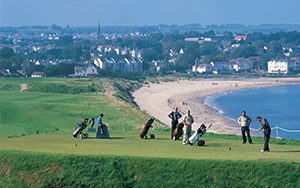 2017 celebrates the 50th Causeway Coast Amateur Golf Tournament, 5th – 9th June 2017. The golf tournament is played over 4 courses, Castlerock, Ballyliffin (Old Course), Royal Portrush (Valley Course) and Ballycastle. If ever there was a stamp of authority that Northern Ireland could use to proudly announce her return to the world’s top golfing table it was the announcement, by R&A, that The Open would once again return to these shores. July 18-21st 2019 will see Royal Portrush, and Northern Ireland, host the tournament and famous Claret Jug for the first time since 1951 in only the second ever tournament held outside of England or Scotland in the competition’s 150-year history. The Open is set to be the biggest sporting event ever held in Northern Ireland and Royal Portrush is the perfect course for such a prestigious honour. With new holes and challenges to be added the course, set in the heart of the breathtaking beauty of the Causeway Coast on the edge of the roaring Atlantic Ocean, will prove a valiant test for the world’s best when they’re welcomed here in just a few short years. If you want to experience the thrill of a Major course, the challenge of golf on the edge of the Ocean, or simply Northern Ireland’s incredible offering, then get in touch. For more information, contact us directly to experience the Home of the Opens exactly the way you want to.